Did you know that Queen Victoria made her first and very important visit to Leeds in 1858? This was the first visit to Leeds by any King or Queen. She came to open the new Town Hall in Leeds. Thousands of people from gathered to see her, Prince Albert, and their daughters, Princesses Helena and Alice. 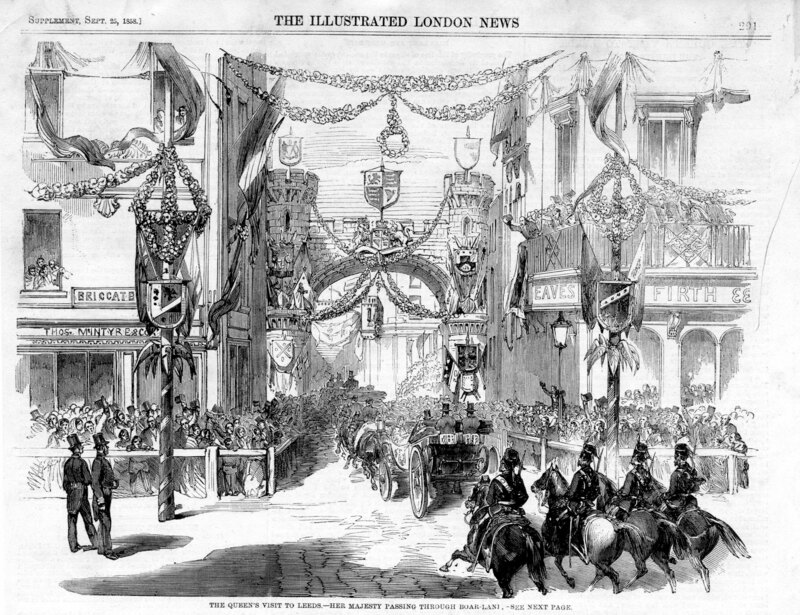 Drawings of the event show the magnificent decorations on houses, shops and factories. 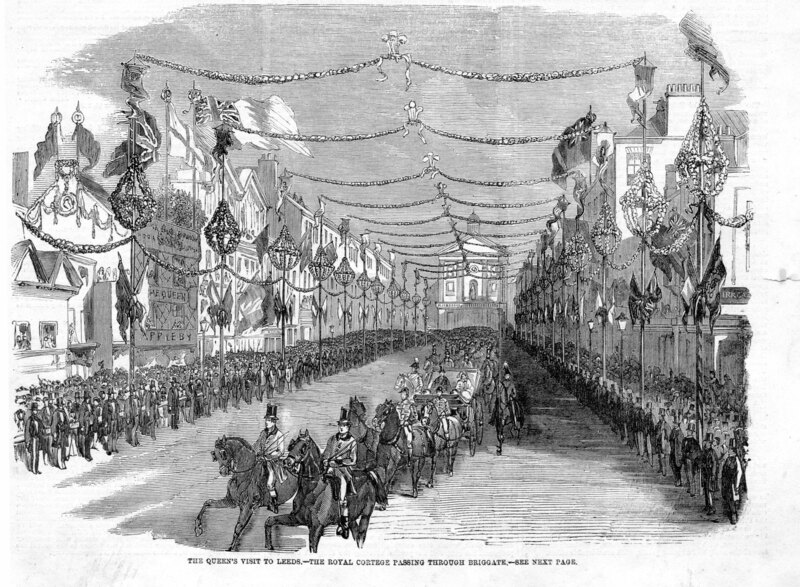 There were triumphal arches, flags, banners, festoons, wreaths, and placards decorating the route that the Queen took on her visit. On the day of the opening the Queen visited Woodhouse Moor, where she listened to hymns sung by 26,000 excited Sunday School children. 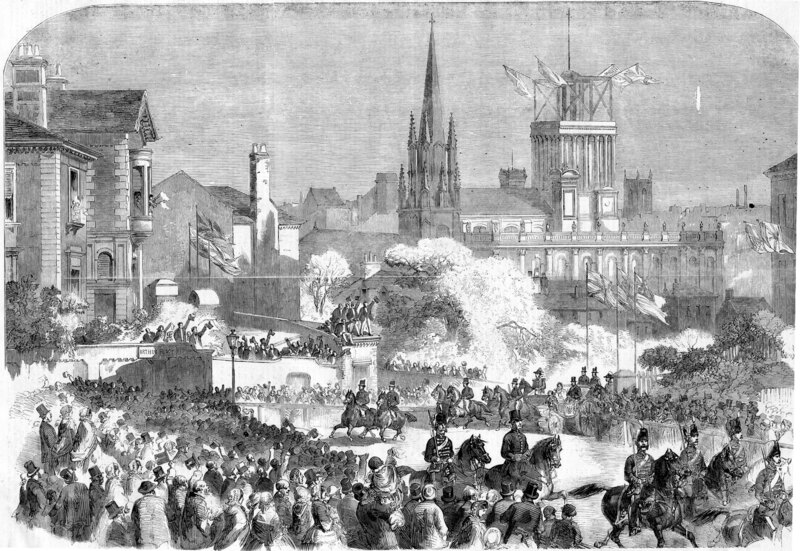 Her carriage then took her along Woodhouse Lane, Upperhead Row, Briggate, Wellington Street, West Street, Queen Street, Park Place, King Street, and East Parade where a huge triumphal arch had been built, to the Town Hall . A massive crowd had gathered in front of the Town Hall. Everyone wanted to catch a glimpse of the Queen. The crowds had to be held back by the police. At one point the pressure of the crowd was so great that it broke the wooden barrier that had been holding people back!